Servus and welcome back to our new challenge for September! This month sees the start of my favourite season but it is also a special month in California - it is Chiari Malformation Awareness month. AND it is a special month for our Guest Designer too - as she has to deal with this special condition. She explains about it and tells us her story today - to help spread some more CM awareness. 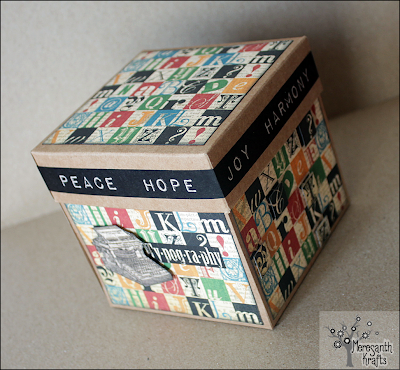 But now, please, welcome our Guest Designer for this month: Mary Elizabeth from M.E. and My Walk on the Creative Side! Hello everyone! I’m Mary Elizabeth, a crafter and mathematics professor from the mountains of North Carolina in the United States. 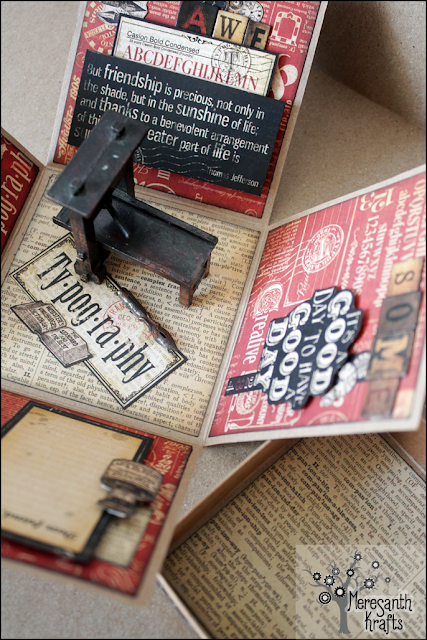 Although I have been scrapbooking for years, it has only been recently that I discovered the joys of Steampunk crafting. Some of you know that I have been struggling with some pretty serious health issues over the last few years. In fact, when my dear friend Claudia asked me to be a guest designer for this challenge at the beginning of the year, I had just learned that I was going to need a rather major neurosurgery. I asked if I could create a piece for September, the month designated to raise awareness for my condition — Chiari Malformation. Chiari (kee-AR-ee) malformation includes a complex group of disorders characterized by herniation of the cerebellum through the large opening in the base of the skull into the spinal canal. The herniated tissue blocks the circulation of cerebrospinal fluid in the brain. In my case, this condition came about as a result of a congenital defect where the base of my skull was a little smaller than normal. It can also be caused by an accident. "...Patients with CM1 (Chiari Malformation Type I) may experience no symptoms. When symptoms are present, they usually do not appear until adolescence or early adulthood, but can occasionally be seen in young children. The majority of patients complain of severe headache and neck pain. Other common symptoms are dizziness, vertigo, disequilibrium, visual disturbances, ringing in the ears, difficulty swallowing, palpitations, sleep apnea, muscle weakness, impaired fine motor skills, chronic fatigue and painful tingling of the hands and feet. Because of this complex symptomatology, patients with CM1 are frequently misdiagnosed." I was misdiagnosed for 15 years. But I’m thrilled to tell you that my latest surgery has corrected a related complication and I feel like I have a new lease on life. 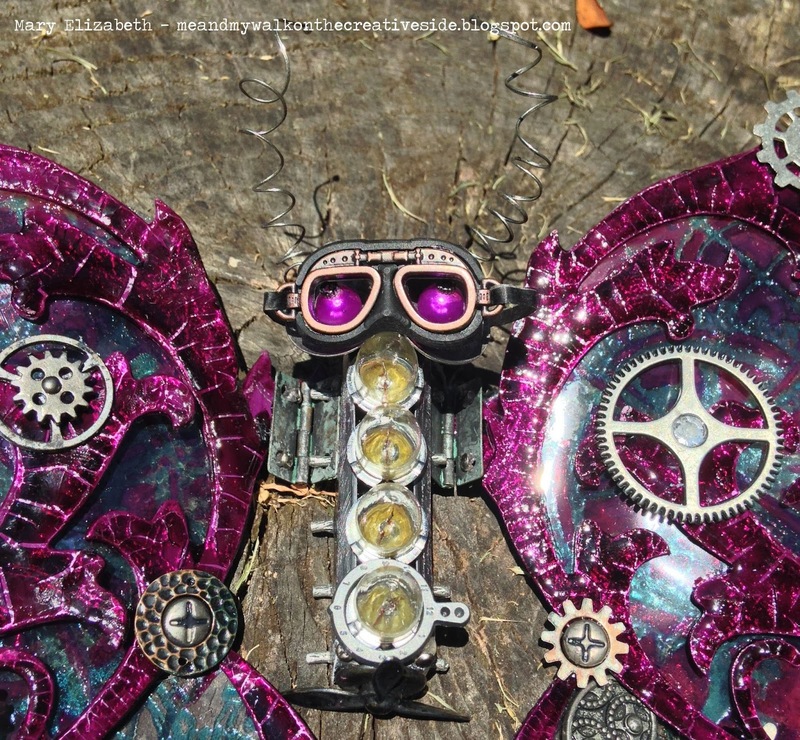 Butterflies are often associated with “new beginnings”, so I chose a steampunk butterfly (with his cute little goggles) to represent the new chapter in my own Chiari story. If you are interested in the details for my story or you are just interested in learning more details about my project, drop by my blog. 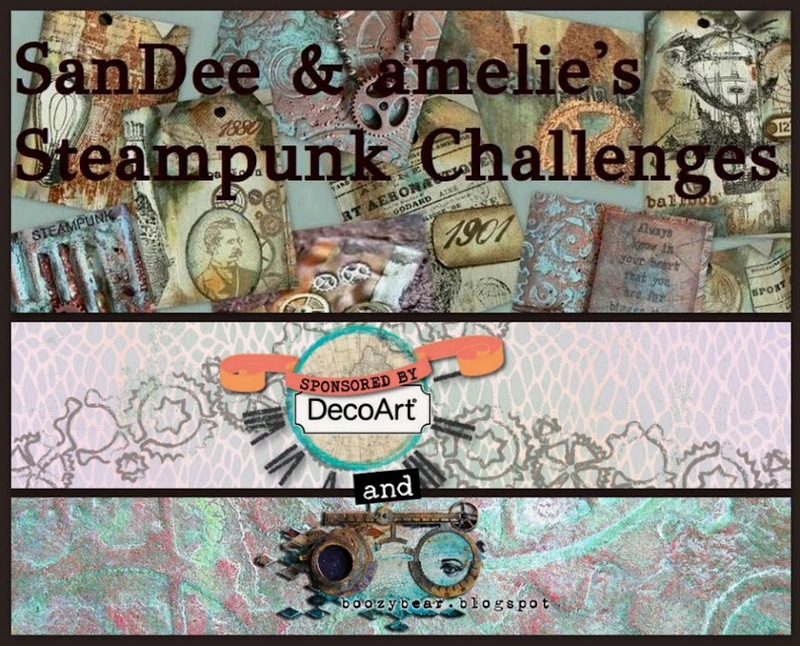 Thanks to SanDee & Amelie’s Steampunk Challenge for letting me use my artwork to provide you with a little information about this illness. a famous french author of many steampunk books. The steampunk workmen have all the time been writing their story in a timebook. Now they have a whole library of timebooks. For my Steampunk Story, I dug out one of my all-time favourite paper collections from Graphic 45 and created a printing-themed exploding box about friendship. What you can see in the middle is an old miniature printing press pencil sharpener (used to be at least, not that sharp presently anymore ;) ). The box tells a kind of a story, too, as the letter tiles form a message as you move the box around. You can see more photos on my blog. For more details and images just click the names to get the the teamies' blogs. And more Steampunk Stories (inspiration) will be provided on September 15th, when Team B will present their mid month inspiration bundle. 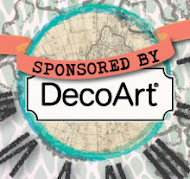 Don't miss it, have fun creating and we look forward to seeing your entries soon! 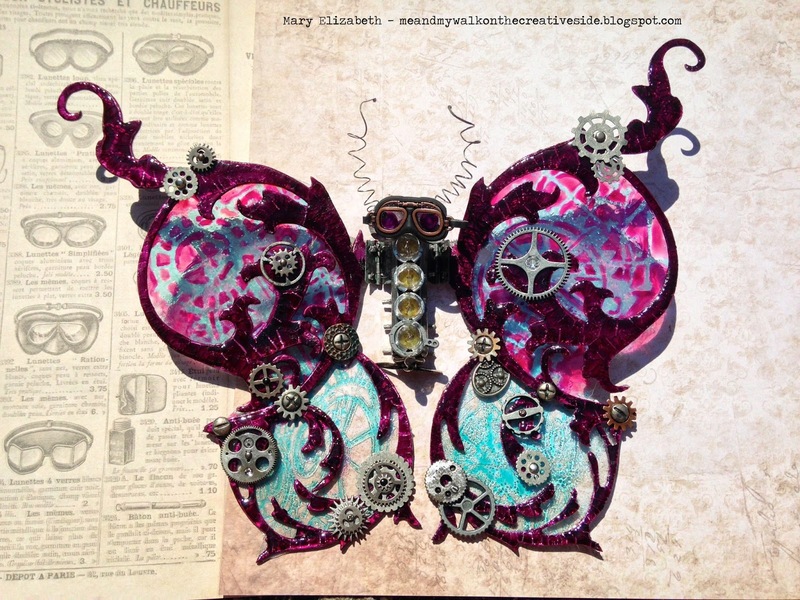 Thank you to Mary Elizabeth for sharing her story and her butterfly is gorgeous! I wasn't able to join the last challenge but am going all in on this one!!! Best of luck with your treatment, Mary Elizabeth. I can not imagine how it must felt to finally get the right diagnosis, as from that point on you can more effectively tackle the cause or the symptoms. 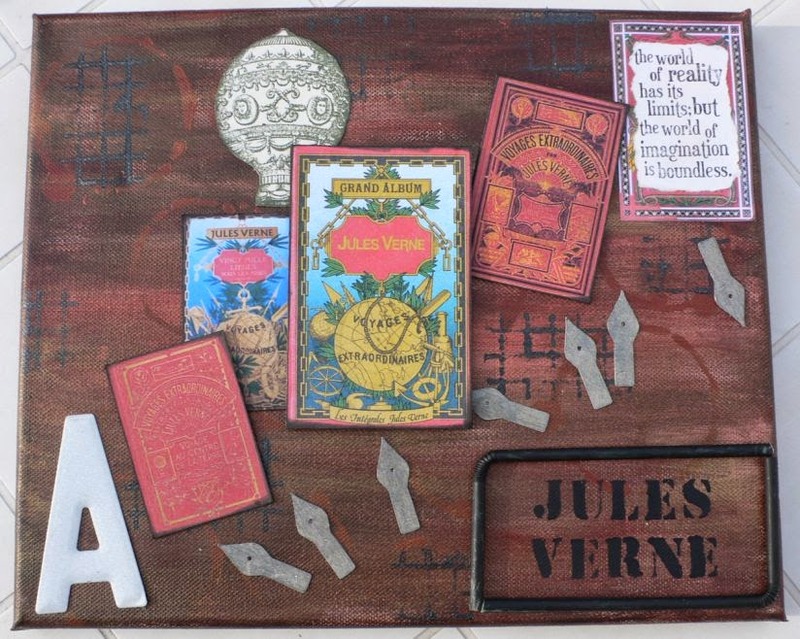 I made my first steampunk card and I am happy to link up with you here - thank you! Your DT projects are amazing! This genre is new to me and I am way out of my element, but I have to start somewhere, right! 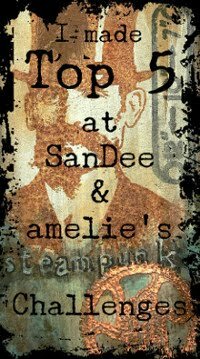 I am your newest follower and I am pleased to share my "steampunk story" with you. Have a good day! Mary Elizabeth your butterfly is AMAZING!!! I am so slow catching up on all my comments lately. My apologies. There is such wonderful detail here and I love the addition of the goggles. Thank-you for telling us more about yourself too. I wish you well with your treatment.